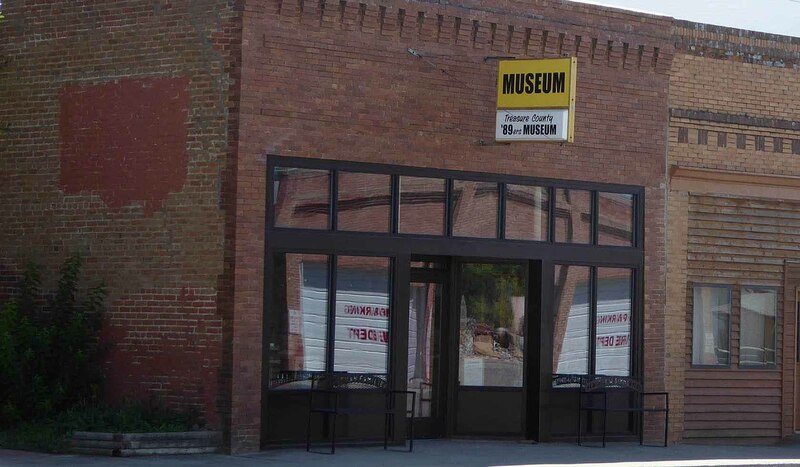 The Treasure County 89'ers Museum started in 1989 with a grant to renovate an old drugstore building on Hysham's main street, Elliott Avenue. The museum complex consists of the museum and the Yucca Theater/Manning Home located across the street. The Yucca is listed on the National Register of Historic Places. Local history is being preserved with displays and exhibits on fossils and dinosaurs, the Crow people, Lewis and Clark, fur trapping, Indian Wars, the coming of the railroad, steamboats on the Yellowstone, law and order, ranching, farming, homesteaders and education. Artifacts include a fossil collection, relics from the Indian Wars and a Cheyenne war bonnet, the rope used to hang some outlaws, a collection of early pharmaceutical store items and a display of kitchenalia and other early household items used by Treasure County residents in the 19th and 20th centuries. Also of interest is a restored soda fountain from the drugstore that is used on special occasions. The museum also features an exhibit on local rancher and farmer, astronaut Frank Borman. Colonel Borman flew on Gemini 7, and was the mission commander for the Apollo 8 flight around the moon. See also the listing for the Yucca Theater. The Treasure County 89'ers Museum: Take the Hysham exit and proceed two miles north on Frontage Road to Elliott Avenue, the main street of Hysham. The museum is located across the street from the Yucca Theatre and the Lewis and Clark exhibit in Hysham.The Treasure County 89'ers Museum: Take the Hysham exit and proceed two miles north on Frontage Road to Elliott Avenue, the main street of Hysham. The museum is located across the street from the Yucca Theatre and the Lewis and Clark exhibit in Hysham.